Cancer is a challenging therapeutic target. 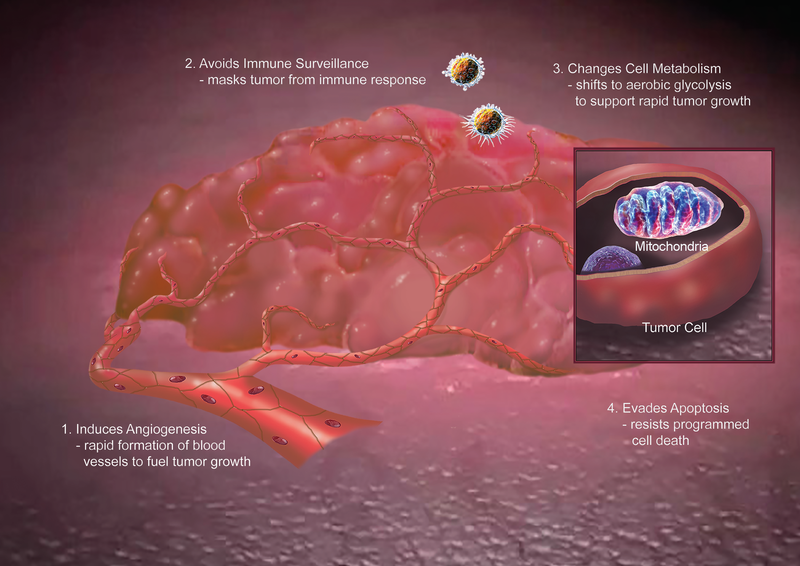 Cancer cells rapidly mutate, often metastasizing throughout the body. Because of these characteristics, therapies based on a single target or biological pathway typically have a limited efficacy window. Further, the twenty-eight (28) solid tumor cancer therapies approved by the FDA in the last five (5) years have an average survival extension of only 5.4 months. Meanwhile, the high toxicity of most cancer therapies typically results in a poor quality of life for patients. NED’s combination therapies are designed to attack cancer on multiple fronts simultaneously. NED’s combinations utilize a dosing approach of the individual components at sub-toxic levels. We believe multi-component therapies will transform advanced cancer (stages II-IV) into a chronic, manageable disease. We are developing NED-170, our lead therapeutic candidate, to be a first-in-class combination therapy. It is designed to simultaneously attack four key processes of all advanced solid tumor cancers using a well-tolerated, oral dosing regimen. We have observed the potential benefit and tolerability of the therapy in 27 patients. NED-170 holds promise not just to change long-term outcomes in numerous cancers, but to radically improve the patient experience during treatment. Building upon concepts elucidated by systems biology information and leading cancer researchers, NED selected well-studied pharmacologic agents known to affect these four major disease processes. The result is designed to provide a combination therapy that achieves broad spectrum coverage against major disease drivers in most cancers, regardless of genetic profile. NED helped me take control of my cancer and allowed me to work to beat my disease. The individual agents that comprise NED-170 have demonstrated, direct affect on the targeted pathways within four major “hallmark” cancer processes. We expect that together these agents will simultaneously strike the targets. Additionally, continuous daily dosing has the potential to shut down cancer’s fuel supplies–angiogenesis (blood) and metabolism (glucose)–while simultaneously boosting the immune system, and stimulating cancer cell death (apoptosis). 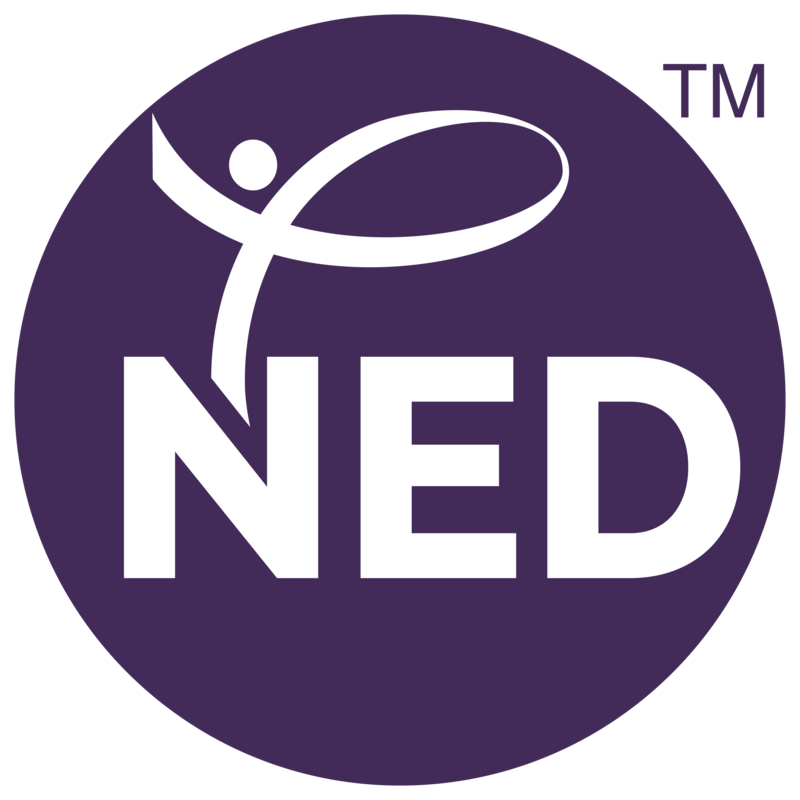 NED-170 is rooted in NED’s founder’s fight to support her sister’s battle against stage IV leiomyosarcoma. Generous guidance from the late Judah Folkman, MD–a pioneer in the field of angiogenesis–significantly advanced the development of this unique combination therapy. Human biology in general–and cancer biology in particular–is often redundant, with multiple pathways generating a similar physiological outcome. As a result, a therapy that targets a single or very few pathways may only have limited overall efficacy, or duration of efficacy, as the body responds by upregulating alternative, parallel pathways. NED-170 is designed to target multiple, parallel pathways within each of the four hallmark processes. The chart below shows the biological pathways affected by NED-170’s individual agents. NED-170 has been tested in a syngeneic mouse model of metastatic colon cancer at a leading contract research laboratory. The results of these studies show that in this model, the combination of the NED-170 components performs better than individual components or specific subsets, and also demonstrate that NED-170 outperforms standard-of-care treatment. 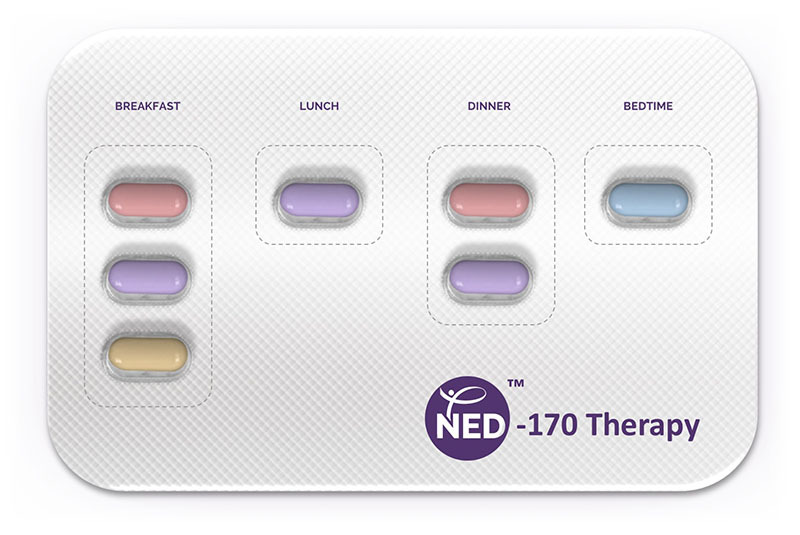 NED-170 has also been tested in twenty-seven (27) individual cancer patients following the NED treatment paradigm. These experiences were not conducted in a controlled clinical trial, but the observational data from these patients points to the potential use of NED-170 across a range of cancer types and stages of disease. Cancer types represented in these case studies include ovarian cancer, breast cancer, non-small cell lung cancer, leiomyosarcoma, head and neck cancer, gastric squamous, colon cancer, PEComa, prostate, and other cancer types. Although we have not run a controlled, randomized, blinded clinical trial yet, to date, NED-170 appears to be well-tolerated. None of the twenty-seven (27) patients reported a drug-related safety or tolerability issues leading to suspension or cessation of therapy. Further, none of these patients required the typical ancillary care (e.g., infusions, ER visits) that is necessary for most cancer patients when treated with chemotherapy or biologics. Given the observed safety, signals of efficacy, and improvements in quality of life, NED Biosystems™ believes there is an opportunity to make a significant impact on the treatment of cancer.